A show stopper for sure! Our Trolley Rental is the ultimate way to get around town while having fun and making people smile! 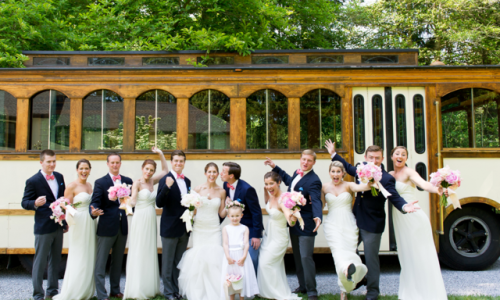 Imagine a trolley transporting you and your wedding party around town! Our beautiful trolley rental is the perfect addition to any wedding or prom and offers a fun way for you and your friends to travel together. A sense of old with a touch of new, the trolley is a comfortable ride and roomy enough for up to 28 passengers. Whether you would like a relaxing ride along the beautiful beaches of the Jersey shore or you enjoy the hustle and bustle of a small city like Red Bank or Hoboken - the trolley can make your night complete!